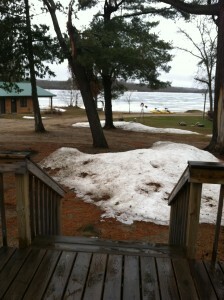 Life at a Minnesota resort: Earlier this week I thought I heard the sound of a lawnmower. I looked outside and saw Jay using the snow blower to move piles of snow out of his way. Half the yard needed a rake and the other half needed the snow blower. What a crazy spring! During most of our years at Wildwood Jay has already gotten one or two sunburns by May 1st. He’s usually been outside 15 hours per day trying to get everything done at once. This year the poor man is trying not to lose his mind as he waits for the chance to start doing everything at once. He’s been accomplishing important business-y stuff that usually gets forgotten this time of year but that is of little consolation. As I write this post we still have snow piles around the resort and reports of 20+ inches of ice on the lake. 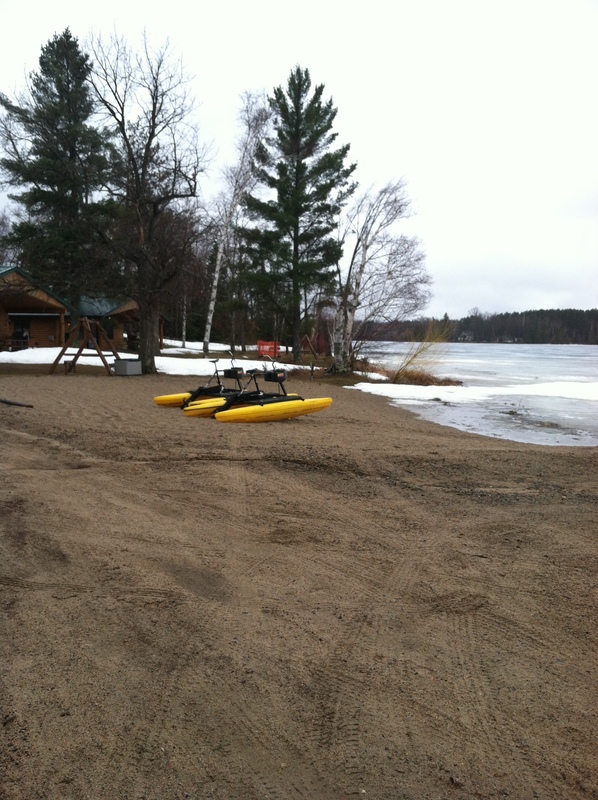 The ice is pulling away from the shoreline but according to neighbors who’ve been out ice fishing (in May!!) there’s still lots of ice. Temps are forecasted to be in the 70s after the weekend so we’ll see if that’s enough spring to get the ice off the lake. If not, this will be the first Opener in our time at Wildwood that we didn’t have ice-out before Opening Day. Here is my annual spring cleaning photo. 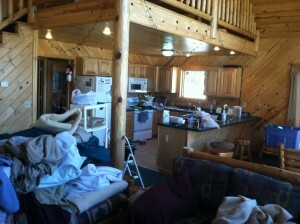 I’m always amazed at the mess we have to make in order to clean up! With the ground frozen and snow piled up around the cabins we haven’t been able to do much of our spring preparations. 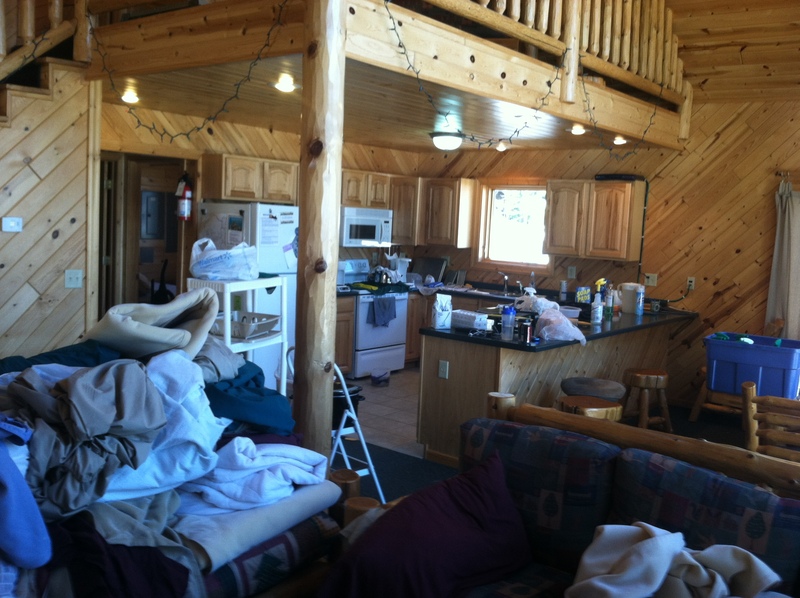 I’ve been spring cleaning the year round cabins but our seasonal cabins are sitting waiting for the ground to thaw enough to turn the water on. Our docks aren’t going anywhere either. I suggested to Jay that he push the docks out on the ice and then just leave them wherever they sank this year. He wasn’t too keen on that idea. 😉 Spring is always a tricky time for us with a small window of opportunity to get LOTS of work done. This year we’ll have even less time to get ready than normal. I’m sure the cabins will be ready and the docks will (mostly) be in but I have a feeling we’ll still be raking up the yard in June! 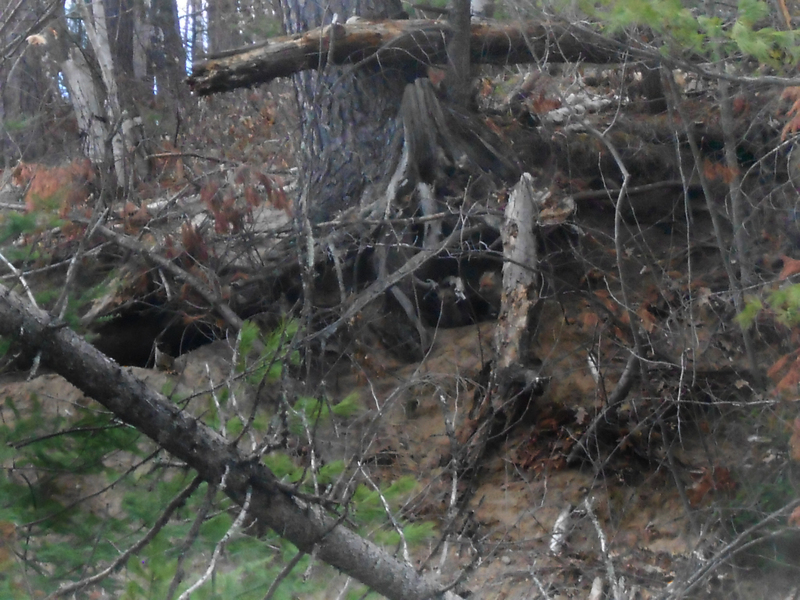 Instead of “Where’s Waldo?” let’s play “Where’s the fox family?” Can you see mama fox and one of her babies peeking out of their den? While we’ve been lamenting the lack of warm weather I have to say that spring has been sneaking up on us. It’s evident in the nest of our next-door neighbors, the eagles, who have a baby to feed and it’s evident in the den of a fox family living just off of our driveway. The young kits like to roll down the hill below their den just like our kids do on the hill in front of Riverbirch Lodge. Some of the hosta around the resort are poking their heads above ground even though the snow hasn’t melted all around them and I heard some Loon calling earlier this week. It’s even raining this morning – not snow but real live, liquid rain that doesn’t pile up and require shoveling. Wow! That’s my pep talk for the week. Let’s all keep our heads up and looking for signs of spring. In a few short weeks we’ll all be in our summer clothes slathering on sunscreen! P.S. 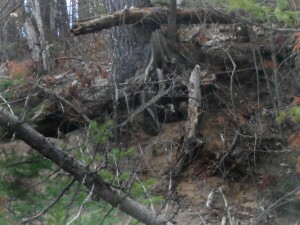 Another sign of spring – there are lots of great things going on in the Grand Rapids, MN area! The calendar of events on the Visit Grand Rapids website is already full of events, performances and festivals. It’s a great place to check out all there is to see and do during your vacation up north. Can’t quite put those hydrobikes in the lake yet! 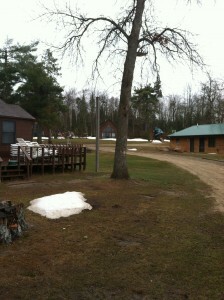 Most of the snow that remains is where Mother Nature or the plow truck made big piles! Just last week the snow pile was too big to use these steps off the deck. This is progress! 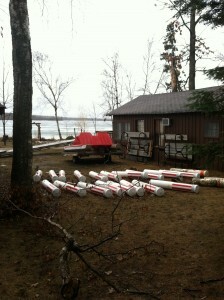 The Itasca County Sheriff’s Department puts the channel markers in Bass Lake each spring. 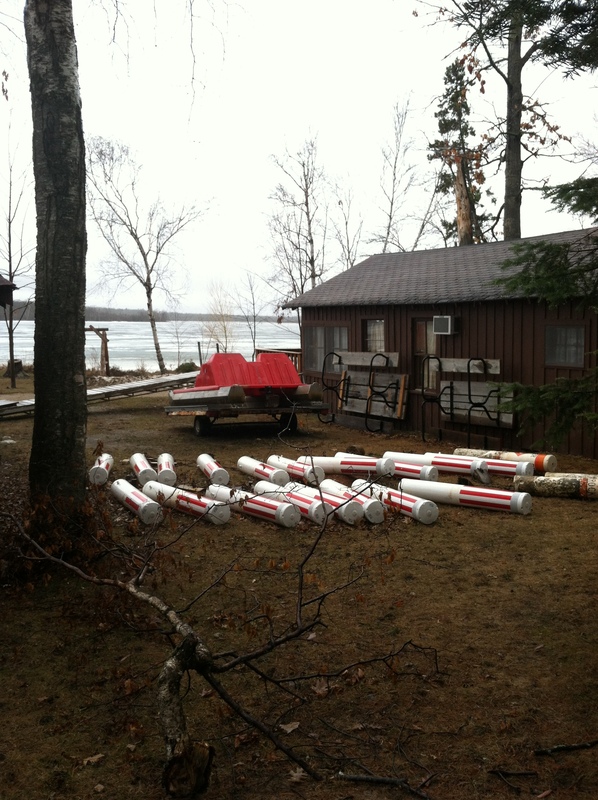 The Department literally has 1,000+ hazard buoys and channel markers to put in area lakes. 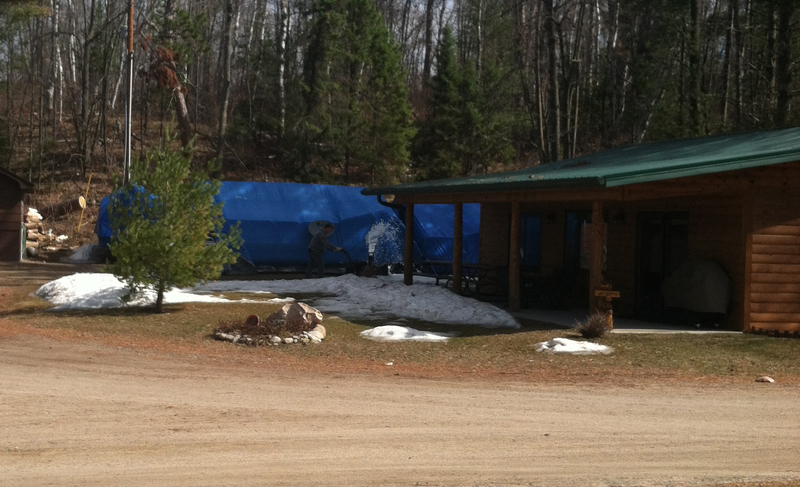 The resort community aren’t the only ones feeling the pressure of a late ice out. Once we have open water be careful on area lakes – it will take awhile for the Sheriff’s Department to mark hazards this season.